Traditionally, judges have had tremendous flexibility in sentencing. Offering judges maximum discretion in the sentencing process allows them to consider not only an offender’s criminal history and the severity of the crime committed, but also the complex web of mitigating and aggravating factors present in each case and additional qualitative factors, such as a defendant’s testimony or selfpresentation in a courtroom. When judges are empowered with more discretion, however, there is heightened potential for inter-judge variability in sentencing. 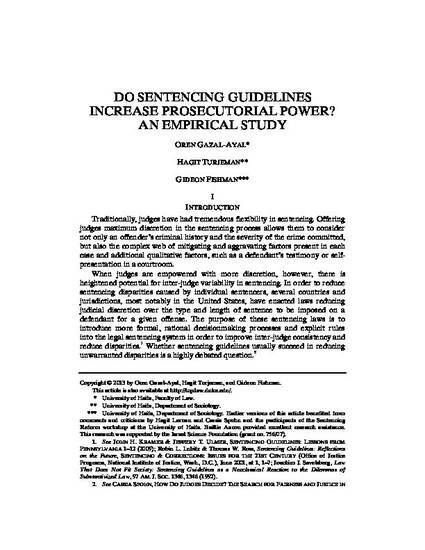 In order to reduce sentencing disparities caused by individual sentencers, several countries and jurisdictions, most notably in the United States, have enacted laws reducing judicial discretion over the type and length of sentence to be imposed on a defendant for a given offense. The purpose of these sentencing laws is to introduce more formal, rational decisionmaking processes and explicit rules into the legal sentencing system in order to improve inter-judge consistency and reduce disparities. Whether sentencing guidelines usually succeed in reducing unwarranted disparities is a highly debated question.